Buy CISS Brother DCP-J125 and make 30 times more quality prints for the same money! Pay only 0.04 USD for A-4 full color print! 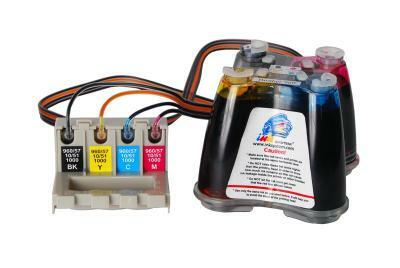 In Brother printer four color system and sectional dividing on reservoirs is applied. That is why you will not have to replace all four cartridge sections, when one of them is empty. You will just refill the consumed ink. But there is much more better solution. Cartridge can run out of ink in the most inopportune moment. The technical capabilities will allow to make great savings on consumable materials, if you apply continuous ink supply system ciss brother DCP-J125. Such capability has not only this model of Brother printer, but also models, which can be equipped with such CIS Systems as ciss for brother DCP-J315W and ciss for brother MFC-J430W. Now you can buy cis brother DCP-J125 for Brother printer as well as for printing devices of other trade marks. Many manufacturers became active and started manufacturing of similar systems. Because rather fast development of inkjet printing requires rising of technological level of printing devices. This is precisely why the installation of continuous ink supply system on any printer becomes more and more attractive offer. Moreover there are a lot of different printer models on the world market, that is why all the users can choose any device on their own account. We can draw only one conclusion: the usage of ciss ink system brother DCP-J125 allows to reduce money costs on consumable materials for printing significantly. Such unimportant disadvantages, which this system has, do not play a major role, especially in comparison with considerable merits of such device. The usage of continuous ink supply system CISS for DCP-J125 allows you to get a higher level of printing efficiency and to lower material expenses considerably. Moreover, the prime cost of color printing will reduce greatly and at the same time the overall quality of printed pages will be better. If the printing device is used in standard mode, it keeps count the quantity of printed sheets and also the quantity of technical cleanings, which are necessary for normal operation without failing. Usually such technical cleanings can be performed by the printer itself, according to the installed program. Users also have to fulfill some cleanings from time to time. After accumulation of necessary amount of data, the printing device blocks the operation till the counter will be reset. If the ink waste discharges into separate container and you have necessary knowledge, you can reset such counter manually and continue operation of ciss for brother DCP-J125.